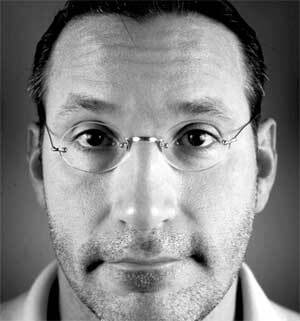 Chip Kidd is a book designer and most recently the author of The Learners. Condition of Mr. Segundo: Contending with form vs. function. Subjects Discussed: The origins of the nickname Happy, Death of a Salesman, laundry list homages to White Noise, Daredevil, Himillsy Dodd’s ability to see into the future, lexical blending, basing characters on real-life friends, the dangers of drawing from personal experience, one-page digressions on form vs. content, capitalizing words for emphatic dialogue, encoding and decoding messages, Stanley Milgram, whether readers obey authors, “The experiment requires you to continue,” research, tracking down Milgram’s obedience film under clandestine channels, text diagrams, Kidd’s hierarchy of readers, Kidd’s concern for precision, generous page margins, McSweeney’s, book design and brick-like manuscripts, page count and paper thickness, trying to design books with diminishing publishing budgets, looking at text in Word vs. looking at text in a book, interior book design, the schismatic design of The Learners, lawyers and off-kilter copyright pages, The Cheese Monkeys vs. The Learners, text that disappears into gutters, reproducing Milgram’s advertisement, colors and fluorescent sensibilities, typeface and meaning, reining typographical hijinks in, the habit of hitting five space buttons for an indent in Quark, the accumulation of trauma, and the many spellings of potato chips. Correspondent: But there’s also something interesting in juxtaposing this discussion amidst an obedience experiment of Stanley Milgram’s. Because you, as author, are essentially dictating, or declaring your particular personal vision, in this particular book. So this leads me to believe that how much the reader chooses to obey by dwelling upon specific stylistic tics is as much a part of the reading process as actually enjoying the story. And I wanted to ask you about this. If this was something you had in mind. Kidd: God! You are so much smarter than I am. You really are. You’ve thought about this in a much more careful way than I have. (laughs) I’m not quite sure what the question is. I think I want the reader to encounter these experiments — at least, at first — as anybody else would have back then. And then once you do, you start to think about it. And then I give the narrator — and thus the reader — this opportunity to go back now and observe them the way Milgram observed them in order to fully comprehend what he was doing and what was going on. And the narrator thinks that this is going to help him. And in some ways, it does. But in the ways that he really needs, it doesn’t. In strange ways, it makes things worse for him. Correspondent: But I guess my question — just to clarify — is to what extent is the reader intended to obey the book’s stylistic dicta that it lays down. You know what I mean? Kidd: No, I think if you’re doing your job as a writer, the reader will be enslaved to you. Kidd: I don’t think I’m trying to make them do anything immoral. You know, I’m not Ann Coulter. What’s the name of the song that played at the end? I liked it too.